In this section of the articles library you will find information about of a lot of different invertebrates that are kept by aquarists. (What is an invertebrate? )If you are looking for information about corals you will find that in the Coral category. You can also find helpful information in the category named Marine Aquariums. Jelly fish is another invertebrate that has gotten its own category here at AC Tropical fish. The reasons why aquarists keep invertebrates vary. Some invertebrates are only kept in order to provide other aquatic animals with food. A lot of fish species will for instance appreciate live invertebrates. Brine shrimp is one of the most commonly raised invertebrates, since they are very easy to cultivate. The common Brine shrimp is also known as Artemia and belong to the phylum Arthropoda. Brine shrimp hatch from dormant cysts. Dormant cysts are metabolically inactive and can therefore be stored for years as long as you keep them in a dry and sealed environment. When you want to cultivate a new batch of Brine shrimp, you simply place the cysts in saltwater where they will develop into adult Brine shrimp. Another example of invertebrates commonly cultivated as fish food is Daphnia. Daphnia is a group of animals commonly known as “water fleas” due to their jerky movements. Daphnia is also called Daphnids and the two most frequently raised Daphnia species are D. pulex and D. magna. 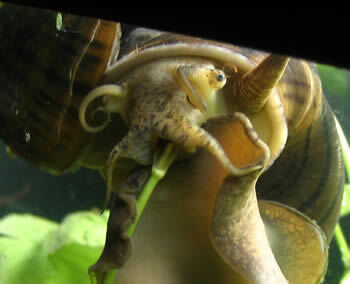 Invertebrates can also be kept in order to keep the aquarium clean. Ghost shrimp and Amano shrimp are two examples of scavenging invertebrates that will take care of left over fish food and other small food particles before the leftovers have a chance to decompose and begin to pollute the water. Ghost shrimp are transparent animals, hence the name. Ghost shrimp will spend most of their time searching for food at the bottom of the aquarium or on the plants. Sometimes you will also see them swim upside down at the waters surface where they feed on tiny floating particles. Amano shrimp are also transparent, but they have a fan-shaped tail and the body is decorated with dotted lines. Amano shrimps are named after Takashi Amano, a famous Japanese photographer that has taken a lot of beautiful pictures of the Amano shrimp. The Amano shrimp is larger than the Ghost shrimp and an adult Amano shrimp will typically be up to 5 centimetres (2 inches) long. They are usually more expensive to purchase that other types of freshwater shrimps, but will on the other hand survive for many years if you provide them with favourable conditions. Invertebrates can naturally also be kept purely because they are beautiful to look at and display fascinating behaviours. The Red Claw Lobster and the Red Clawed Mangrove Crab are two examples of interesting invertebrates that can be successfully kept in aquariums. The Red Claw Lobster is actually not a lobster; it is a type of crayfish. Today it is also known under the more accurate name Red Claw Crayfish. It is not a highly aggressive species and can be kept in a fish tank, but avoid keeping more than one Red Claw Lobster in your aquarium unless the aquarium is cleverly decorated and large enough for the animals to stay out of each others sight. Small and slow moving fish are also unsuitable tank mates for your Red Claw Lobster since they will be considered food. Common Cleaner shrimp - Information on how to keep this saltwater shrimp. 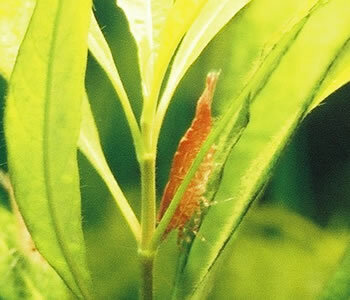 Crystal red shrimp - Learn hod to keep and breed this exclusive shrimp. External Shrimp Anatomy - Introduction to shrimp anatomy. Fan shrimp - An introduction to fan shrimps. Nerite snail - Information on Nertite snails. Rudolph shrimps - Info on how to keep and breed this species. Snail control & copper - Uses and risks of copper sulfate to treat snail infestations in the freshwater aquarium. Spixi snails - An introduction.